This reviewer desperately wants to like The Water Diviner, the directional debut of Russell Crowe (who also stars). It is no doubt well-intentioned, and is handsomely put together – but even so, it still doesn’t gel as well as it should. Based on the book of the same name by Andrew Anastasios and Meaghan Wilson-Anastasios, with the former credited here as co-writer alongside TV writer Andrew Gold, the film adaptation knows what it wants to do but isn’t entirely sure of how it should approach it. It starts strong enough; Crowe’s Australian farmer, first seen digging a well in one of the film’s most joyful sequences, is motivated to find and bring home his three sons after they go missing during the Battle of Gallipoli after his wife drowns herself. Any scene that sees Crowe interact with his family, especially his sons, are some of the strongest in the entire movie; say whatever you want about Crowe’s usually stiff acting, but he understands how to conjure emotion out of his fellow actors, who all benefit from having a fellow actor to guide them through some of their more difficult scenes. Crowe himself, meanwhile, gives an understated performance that let certain others shine in his stead. Whenever the film focuses on what it should focus on, in this case the relationship between Crowe and his MIA sons, it works. However, as soon as he arrives in Istanbul and checks himself into a small hotel, things start to lose their balance and become less interesting. Taking up a good amount of time in its spare moments is a blossoming romance between Crowe and Olga Kurylenko’s widowed mother who helps run the hotel, which doesn’t manage to fit with the overall tone of the film – would he really be taking an interest in someone so soon after his own wife’s death? It doesn’t help that both actors don’t have a particularly strong chemistry with each other, with the scenes meant to show a growing bond between them feel a little forced and contrived; same goes for Crowe’s growing bond with Kurylenko’s son Orhan (Dylan Georgiades) who unfortunately comes off as more irritating than adorable, especially when he’s introduced in an overly-whimsical market chase. Any tension the film has at this point with the missing sons is halted completely when Crowe indulges in this sugary romance that goes on for longer than it should. Perhaps the problem lies with Crowe the Director, who here shows clear signs that he’s very new to being behind the camera. He seems to rely heavily on contrivance to move the story forward – for inexplicable reasons, a British army captain (David Wyllie) seems determined to remove Crowe from the occupied Turkey and in doing so makes his character a more cartoonish and over-the-top villain by the minute – and may need to ask for help with his staging and camera movements, with close-up zooms on actors’ faces during small dialogue scenes distracting one from the overall purpose. That being said, however, there is something suitably old-fashioned about the style he brings to his direction here, almost like something David Lean could film in his sleep. When he wants to, Crowe can make the film look gorgeous and atmospheric, from the sand-swept Australian deserts (including one large-scale set piece during a sandstorm) to the yellow-tinted streets of Istanbul – this is thanks to Lord of the Rings cinematographer Andrew Lesnie’s sharp imagery – and, again, he has a clear idea of the story he wants to tell. It’s a shame, then, that the film falls just short of achieving what it sets out to do. We feel bad, because as far as debut directing jobs go Crowe isn’t doing the worst job here, but his inexperience behind the camera really shows in his sugary and confused approach to the material. Maybe this kind of film could work in the hands of another, but it’s probably not ideal for a debut project like this one. As a director, Crowe does have promise and it’s likely that he can build on his technique from here on – but The Water Diviner proves he’s got a long way to go. 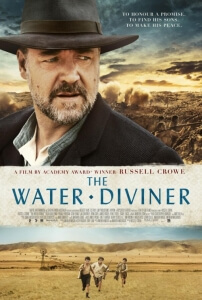 The Water Diviner is a passable and good-intentioned directing effort by Russell Crowe, who has a clear idea of the story he wants to tell but his overall inexperience behind the camera continuously prevents him from unlocking the story’s full potential.